Let your name be on the MOVE with Us! Biggest Advertising Board on Road!! Turn your ad into a moving billboard with KGL Mobile Advertising. 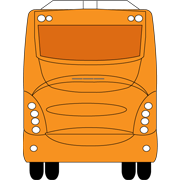 Our buses will spread your message in the most cost-effective way. Unlike any other advertisement mode, cannot be avoided, changed or turned off. Your ad will simply be infront of a wide range of audience and part of the environment, attractive and hard to miss! Concentrating on one type of outdoor media, the biggest and most eye-catching, KGL provides large format, high impact bus advertising. Placed in a clean and professional style, we provide the client and viewers the best quality for any campaign. More than 18 routes, and new routes regularly opening, to choose from according to client’s specification and fitting every target, spreading in Sharjah, Ajman, Dubai, Abu Dhabi, RAK, Khorfakan, Umm Al Quwain, and Fujairah , having 140 buses in operation. Biggest advertising board on road! With its enormous size, such ads are hard to miss especially that people on the move, whether walking or driving tend to be more aware of their surroundings therefore having a greater response for such ads. Hitting a large audience of people without an excessive cost, grasping the city’s attention day and night. KGL buses operate from 5.30 am through peak times till 11.30 pm. Repetition: Guaranteed on consistent and prominently repeated basis, where the ad will remain in the viewers mind after its recurrence. An average of 21,000 km per month is consumed passing near malls, coffee shops, homes, business centers, parks and more; making around 8 trips per day. Currently our ridership is more than 760,000 people per month from different nationalities. We have more than 34 buses operating in the routes of Sharjah International Airport, the host of 5,280,445 passengers in 2008, attracting tourists and locals. 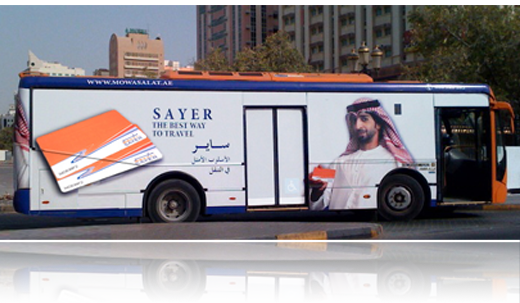 Clients choose the period of advertising on the buses according to their campaigns and special incentives will be offered. Art work and special designs can be provided by the client or created by KGL design specialist. Client hands his poster/ad and leave the rest for us. Designing for a vehicle wrap needs special knowledge of the wrapping process and of our different kinds of buses and measurements, to keep the ad impact while transforming the artwork from screen to vehicle, and that we have with our experienced designers. Understanding and listening to clients is crucial for creating design fitting to client’s needs and standards, imprinted ensuring the visibility of our client’s brand. We will provide approvals from Sharjah Transport and Municipality. Clients will stay informed though the design and printing process till the finishing ensuring high large format quality vinyl prints. Full wrap covers the entire bus sides including the windows with high quality pixilated cast vinyl. It also includes the full back side with its window. StreetLiner wrap covers full lower right and left sides, excluding the windows. Full coverage of the back side and its window. Opposite of the Street Liner, Sky Liner covers the top left and right sides of the bus that include mainly the windows with a two way vision vinyl. Full coverage of the back side and its window. Super Side wrap is concentrated on the middle areas of the bus, covering between both the front and rear tires forming a square shape wrap. Full coverage of the back side and its window. Super Back cover fully the back including the window and rear bumper with side panels. Viewer can easily spot the back passing or in traffic jam. Different rental periods are offered giving our clients the flexibility in choice for their ad campaigns. Our rates are fitted to suit every need and budget being the most cost-effective between competitors and other emirates, maintaining superior quality. Advertise on KGL Buses for your next campaign as enticing discounted rates and incentives will be revealed!